A trio of user-led organisations have challenged the capital’s next mayor to address the inequality faced by disabled Londoners. Inclusion London, The Alliance for Inclusive Education (ALLFIE) and Transport for All launched a manifesto this week, which brings together the key commitments they want all of London’s mayoral candidates to sign up to. The Disabled People’s Challenge To The Next Mayor of London includes polices on independent living, inclusive education, transport and housing. More than 30 disabled people were outside City Hall to launch the event (pictured). 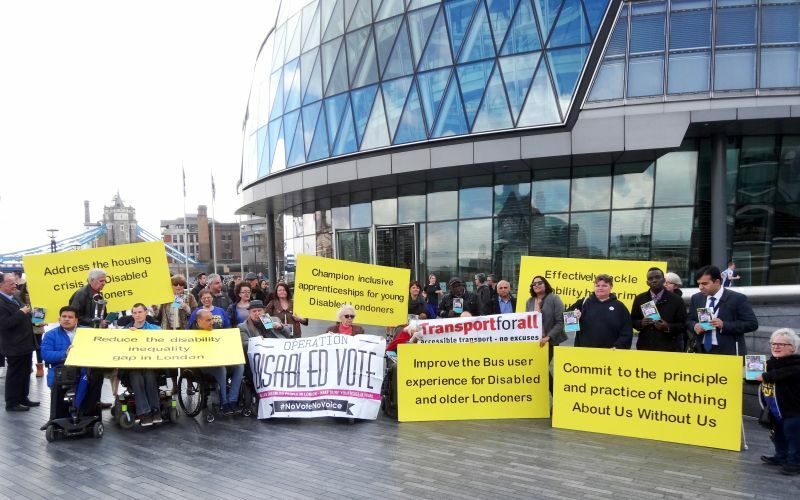 The three disabled people’s organisations (DPOs) point out that the mayor and the London Assembly – which is also facing elections on 5 May – have “significant powers that can address disadvantage and enable disabled Londoners to participate as active citizens in the life of the capital city”. The main candidates seeking election as mayor are Tory Zac Goldsmith, Labour’s Sadiq Khan, Sian Berry for the Greens, Liberal Democrat Caroline Pidgeon and UKIP’s Peter Whittle. Among the policies in the manifesto, the three DPOs want to see the mayoral candidates commit to carry out more co-production of policy with Deaf and disabled Londoners, including appointing a disability equality policy adviser who will “truly embed a social model approach to disability” across the work of the Greater London Authority (GLA). 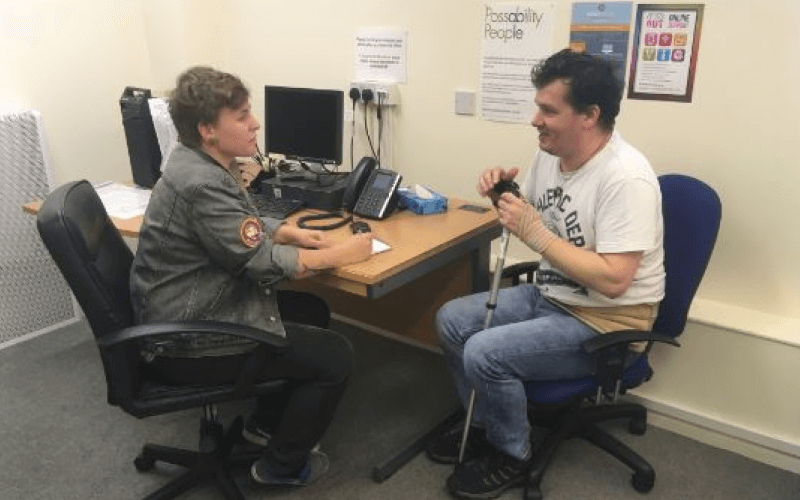 They want to see a commitment to “adequate access to information, advice and advocacy”, to promoting the employment of Deaf and disabled people, and to carrying out a “comprehensive assessment of accessible and adapted housing”. They also want all service-providers that work for the mayor and GLA to ensure they meet their legal duties under the Equality Act and show a “continuing commitment” to providing accessible and inclusive services and employing Deaf and disabled people. Disability hate crime is also mentioned, with the manifesto calling on the next mayor to fund and promote DPOs to run third-party reporting centres and provide advocacy for victims. On transport, they want to see stricter penalties for bus companies that fail to enforce the priority for wheelchair-users in accessible bays, and do not give passengers enough time to sit down before the vehicle moves off. And they want faster progress on making London’s tube and rail stations accessible, and a promise to make at least 25 per cent of London’s minicabs wheelchair-accessible. On education, they call on the mayor to bring together local authorities, schools and DPOs to work together to “identify barriers and solutions” to promoting access to mainstream education provision across the capital, and to champion inclusive apprenticeship opportunities for young disabled Londoners.